Add on Units (Super Adjustable) consist of 2 posts, indicated number of shelves, and 2 “S” Hooks per shelf, for attaching shelf to adjacent unit. 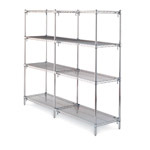 Super Adjustable Super Erecta Shelving is the most advanced and innovative wire storage system available. A unique corner release system and SiteSelect Posts make changing shelf levels fast and easy without tools! Furthermore, Super Adjustable Shelving works in conjunction with the entire Super Erecta System of shelves and accessories. Quick adjustment at 1-inch (25mm) intervals. Easily configurable for stationary or mobile applications. Because you only use 2 posts with add on units, you save money when doing a continuous run of shelving. Furthermore, “S” hooks connect shelving add on units to starter units. This saves time and money during installation and design. Unts can be installed at right angles to each other. Add on Units (Super Adjustable) consist of 2 posts, indicated number of shelves, and 2 "S" Hooks per shelf, for attaching shelf to adjacent unit. Super Adjustable Super Erecta Shelving is the most advanced and innovative wire storage system available. A unique corner release system and SiteSelect Posts make changing shelf levels fast and easy without tools! Furthermore, Super Adjustable Shelving works in conjunction with the entire Super Erecta System of shelves and accessories. Because you only use 2 posts with add on units, you save money when doing a continuous run of shelving. Furthermore, "S" hooks connect shelving add on units to starter units. This saves time and money during installation and design. Unts can be installed at right angles to each other.